A few years ago, we started Hackaday.io as a project hosting site for The People Who Actually Make Stuff™, and since then we’ve been amazed by what the community can put together. We have well over 100,000 hackers on board in an awesome community. Sometime around September, a few members of the Hackaday.io community decided to follow in the footsteps of the very successful contests we’ve had on Hackaday.io. This led to the Square Inch Contest, a challenge to put the coolest electronics inside a square inch PCB. An inch the distance light travels in 1/11802852665.12644 of a second for those of you without freedom units. With almost eighty entries, the judges had a very difficult task ahead of them. In the end, only one project would be the best. 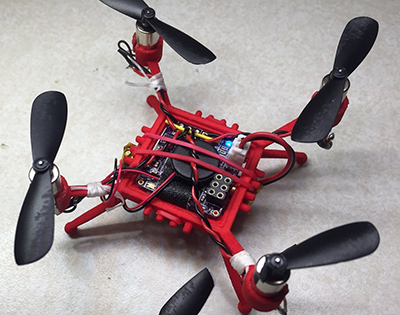 The winner of Hackaday.io’s first user-created contest is Quadcopter In One Inch from [jeff]. This wins the grand prize of a $100 credit for the Hackaday Store and a $50 gift certificate to OSHPark. RFID Air Pressure Sensor, a device that puts the technology of tire pressure monitors into bikes. Small Voltmeter, a breadboardable volt meter built around old bubble LED displays. Micro Word Clock, a word clock built around an 8×8 LED matrix. Square Inch USB Sound Card, does exactly what it says on the tin. Micro Progmeter, a volt and ohmmeter with OLED display. The judges for the Square Inch Project would like to give an honorable mention to Twiz and the blinktronicator. The judges would also like to express amazement in how much work actually goes into judging a contest on Hackaday.io. Spending a few weeks working on the judging for a contest with eighty entries imbues a sort of respect for people who can judge a contest with one thousand entries in three days, as the Hackaday crew has done with two Hackaday Prizes so far. While they were doing that, I was sitting back and cracking jokes about Fleiss’ Kappa. 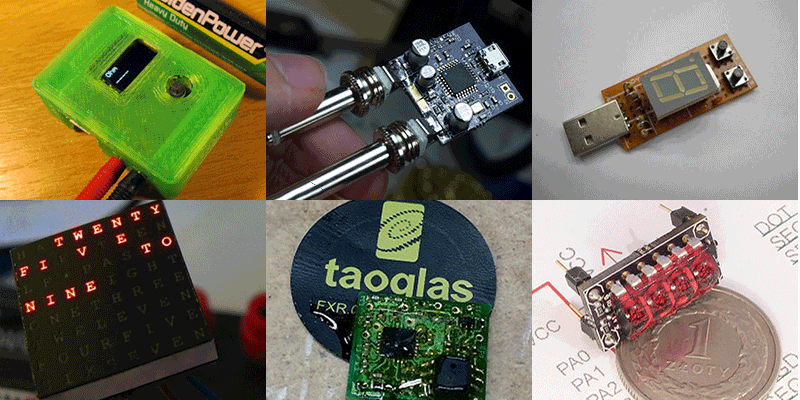 This was the first community-created contest on Hackaday.io, but it is surely not the last. We don’t know what the next contest will be – that will be up to someone on Hackaday.io – but there will be one, and like the Square Inch Project, it will be awesome. I vote for the Square Centimeter Contest! Or the DIP-8 Contest. A dip 8 contest would be fun: what can you do with a single DIP8 part in your circuit(nothing bigger) …whether it is a micro or anything else. I like the micro word clock best! I don’t like the idea of restricting to through hole only parts. My idea was actually to make a board that fits into a DIP-8 form factor. I vote for the Judges that had to Weed through that Mess called Hackaday.io. I clicked on one of the finalist links and when the page loaded I closed the Tab an asked myself why the f**k I bothered. Freedom units? Really? There are a grand total of three countries in the world that “officially” use Imperial units only, USA, Myanmar (aka Burma) and Liberia. I’m gonna go out on a limb and declare the majority of that list of countries are not “free” countries. Would it have made you feel better if they had called it a 25.4mm square contest? FWIW, the imperial units here in the US are defined in terms of SI units, so use math. If you are designing electronics, you pretty sure have to have some sense of the imperial system, even if you are outside of US anyway. Not that a big deal, more just a nuisance. if it helps anyone, the winning entry is actually 25.0 mm, and laid out on a 0.5mm grid. Correct me if I am wrong, but it was a joke making fun of American Exceptionalism. Its pretty common in the US to give things ridiculous freedom names, mocking the scarily high number of Americans that actually think that way. Now here’s someone with an American Grade™ sense of humor! No other country in the world has a population with such keen insight into literary devices such as irony! America is so great! Third greatest country in the world right after God’s and Marlboro. I’m afraid Marlborough is no longer an acceptable sponsor. Try Cowpunk. Browning frowns in your general direction. I was once told that if you’re in a foreign county and not sure of the exchange rate just go and have a look at the price of a big mac. ITT people who didn’t get Brian’s joke. Congrats to the winners! Great contest–looking forward to the next one! Congrats to the winner of grand prize! I’m honored to be one of the six who won other prizes. And thanks for this contest. thanks. congrats to you (and everyone else) too. and thanks contest masters, this was a lot of fun. No problem— it was a blast! I would also like to congrat the winner of the contest as well as to thank for the contest itself. I had a lot of fun participating and I long for the other contests to come! The “freedom units” troll is really getting old. But the contests are great fun — surprising how little you need to make people realize the ideas they had been carrying in the backs of their heads. I still haven’t gone through the whole list yet. I wonder if it would make sense to actually build an “organize a contest” button into hackaday.io. You know, so that you would have a consistent layout for the descriptions, list of entrants, maybe even public voting. And so you could enter your projects with a simple dropdown list, like you can for the hackaday prize. Most work would still have to be manual, but at least some of it could be automated. Oh come on. There is no freedom in US anymore. Not since cold war, or even before that. Imperial units suit United States very well. FYI, the U.S. has “officially” been Metric since (IIRC) 1895! Yup, we are rather confused, stones, lbs or kg for weighing people, miles for distance(long) metres/cm/mm for distance(short), sometimes inches too, if I’m woodworking I go with whichever one is closest, officially grams for item weight, but you can still ask for food in lbs, and both gallons and litres, depends on what you are liquidating..
It’s funny, because you dispense fuel in litres at the petrol station, and quote miles per gallon for fuel efficiency (at least, in Top Gear they do) which makes no sense to anybody given that a UK gallon isn’t even the same as a US gallon. This was a great idea. I’m thrilled to have won one of the prizes. Thanks for the contest! Is it me or is the copter 25x25mm? Yep, 25mm is just less than an inch. Test. The comment box isn’t working? Will this becom anual or at least bi-anual thing? Because the entries are awsome and now I feel bad, that I didn’t enter my own project. I think it is awsome to have so limited requiremets with unlimited posiblities and ideas. And it costs HAD less than a $1k. Maybe add a plaque for top 10 entries 1″x1″ in size. Hi. I’m from three years in the future. You’re about to get your wish.